Lately, getting through the night has been pretty rough. My son, Michael, is going to bed as well as could be expected on a 1-year-old, but he has been waking up hours before dawn. Sleep deprivation can bring a lack of observation. I failed to notice the telltale signs – runny nose, irritability, appetite loss, chewing on everything including his own fingers. Finally it occurred to me that he’s been trying to send a message the whole time: new teeth! Unfortunately, there is no easy baby sign language for them to explain this phenomena. My daughter’s teeth all seemed to come in at once and early. I remember losing teeth as a child and then a new tooth showing up in its place over the next couple of weeks. The worst part was the losing of the loose tooth. For a baby, it is the opposite -a baby does not yet have the gum path forged. In many cases, parents can discover the little white peak and call the grandparents over to see. By the next day, about the time that the out-of-town grandparents arrive, the tooth has disappeared! The gum actually envelops the tooth once again forcing your child’s teething to begin anew. This can happen several times before the gums give up and the tooth is allowed to protrude from their swollen plain. Teething Tip #2: Take a picture before the grandparents arrive or they will doubt you. Gums work faster than they drive. Often, parents of a baby will see the first tooth around 3-9 months of age. When you see those first teeth, do not delay in getting a picture. Once the first one pops out, the rest seem to sprout up very quickly. If your camera is sitting in your kitchen uncharged or your SD card is full, when you review your pictures later in life, you will go from “Gummy George” to “Toothy Tim” without any transition imaged. Not all children have teeth emerge after a few months. One of my coworkers was worried all the way up until his daughter’s second birthday because she had no teeth. She found ways to gum through softer foods like bananas and mashed potatoes just fine. Her dentist assured my coworker that by age 5, all kids end up with about the same number of teeth – as long as she wasn’t malnourished, he was fine. The American Dental Association recommends using a clean finger to soothe your child’s gums as they are teething. Any experienced parent or person thinking clearly will tell you that sticking your finger in your child’s mouth when they are gumming is not a good idea. While their bodies are quite small and fragile, their jaw reflex is incredibly powerful and they will chew right into your finger – tooth or not. I need my hands to work and came up with an alternative teething device. While I sometimes have a non-traditional approach to parenting, teething has not been an exception. Sanding down an inch-thick wooden dowel may not have gotten me many points from the mothers walking with bags from baby boutiques, but it got me results. Gnawing on these dowels kept my daughter happy through her teething and cost very little. Also, like I mentioned in a previous article, hardware stores are open earlier to accommodate contractors and tired fathers! 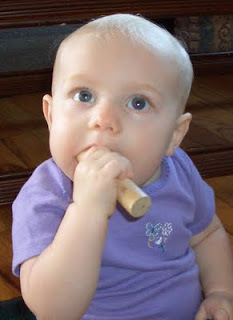 Teething Tip #5: If you use your finger, be ready to lose your finger! Unconvinced by unconventional teethers? Fortunately a whole industry of baby accessories has you covered. There are teething rings, rings of teethers, refrigeratable teethers, vibrating teethers, teethers that glow in the dark and teething rings of every shape and color imaginable. Do not buy them all – you will probably need a maximum of three teethers. As you rotate through, clean and refrigerate the others. Teething Tip #7: Once your child grows out of teethers and becomes a toddler, save and freeze the rings to be used to comfort their various bruises and cuts as they run and trip and bump into the house you once believed was childproof. If traditional and non-traditional teethers are still not doing the trick, it may be time for the big guns. I am often asked why I don’t “write an article about rubbing rum, whiskey or brandy on the baby’s gums to numb them – that’s what my parents did and I turned out fine.” Of course, this is usually mentioned to me in a semi-drunken slur by non-parents. While I do propose that using rum as a teether will lead to future alcoholism, I have also never seen any reports to the contrary. Our family doctor recommended basic teething gel and baby Tylenol used only occasionally as directed on the package – it has done us well thus far. Finally, with the loss in appetite, frustration can ensue. A tired parent can be less creative and less understanding when their child stops eating the same foods that have made them happy since nursing. If you think that your child may be teething, try out frozen peas, corn, blueberries or soybeans. Depending on the child’s age and the size of the food, blueberries or soybeans may be too large. At feeding or snack time, present them with a small bowl of frozen peas and watch them gobble them up. My kids both know where to point in the freezer (even when it is closed) to get to the peas. Aside from good nutrition during teething, I may have discovered the sign language sign for teething after all! We used to do the frozen peas....our daughter actually requested them as a "talking toddler" by saying "Popsicle peas,please".......wishing you a good night's sleep! Thanks for these tips on coping with teething. This will be useful for the nervous parents. This is amazing. This would be perfect advice for my friends and some of my patients who have babies. This is exactly what I need. I was looking for tips for teething so I searched Google and found your post. Thanks for sharing this. I have to agree with you that sleep deprivation can bring a lack of observation. It made me realize how beneficial sleep is. These tips are going to help a new mom like me. My baby is just a month old and I'm preparing a lot specially when her first tooth comes out. My dentist in Champaign IL advise me to notice these symptoms too so I know what to do when the time comes. the articles on this article is really one particular of the most effective substance that I've at any time are available throughout. I really like your submit, I will occur again to verify for new posts. Nicely written - Great information. Thanks for sharing it with us.If you have time please visit my nettoyeur ultrasons page and let me know what you think. Thanks for the useful tips that you have provided for me, I think that it is very useful for most people, besides, what I want to say is that your baby is really cute, have a nice day! !